"City of St. Louis Park"
1st Lt John C. Dahl, Jr.
Sgt John E. Gerbig, Jr. Received an email from the cousin of Lt. Col. Richard B. Vogenitz, USAF (Ret), notifying us that has taken his Final Flight. Received call from Lt. Col. Richard B. Vogenitz, USAF (Ret), that his Airplane Comander, Capt Gordon A. Anderson had taken his Final Flight. Contact has been established with John Gerbig, Jr., who will be sending information on his crew. One of the things he shared was that their FE had passed away. 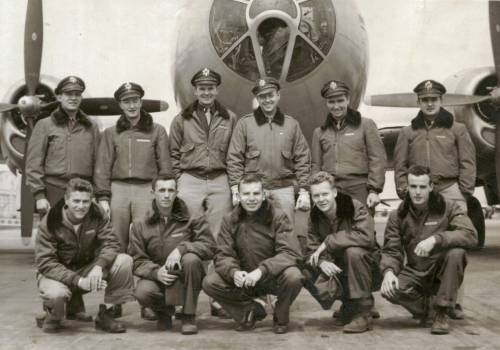 Gerbig told us the name of this crew's B-29 was nicknamed "Liberty Belle II" named after the B-24 Capt Anderson's brother flew (see above). He has provided leads on contacts with other members of the crew - please check back.